So I’m nine months into this. It’s sort of become second nature to keep to £15 a week, although I have gone over a couple of times. So this week was marked by my being really tired and while I was hungry and I planned my food during the day pretty well, the evenings weren’t as organised, it’s like I run out of the ability to make decisions after 3pm! This week I was also really bad about taking photos of my food! I had a massive craving for a fishfinger sandwich so bread and fishfingers were required, fishfingers are amazing! Shopping came to £9.01 over Lidl and Sainsburys. 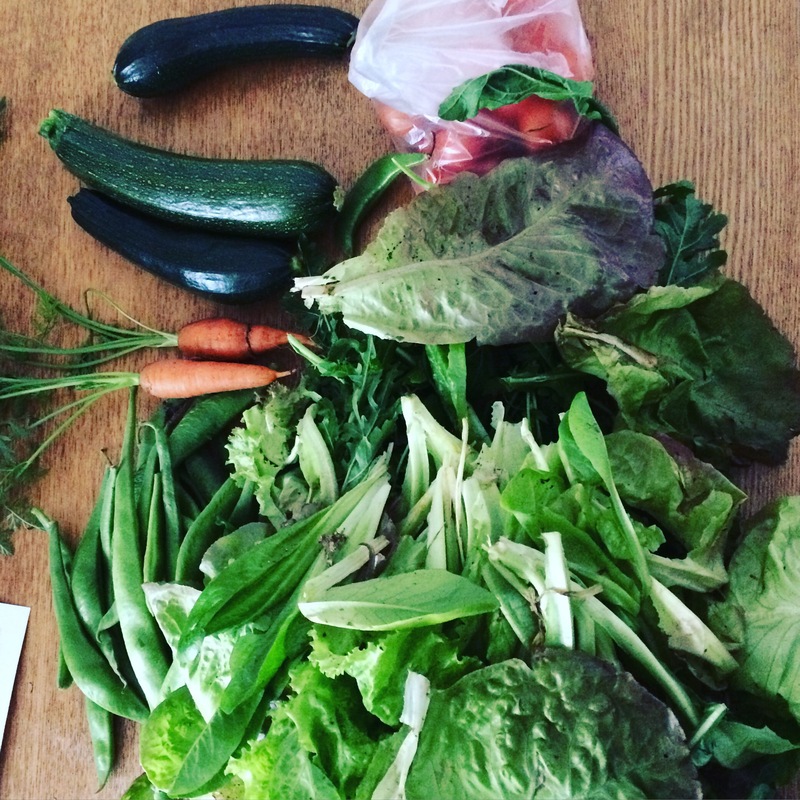 There were tomatoes, courgettes, salad leaves (the last of the salad leaves) and runner beans from the allotment, plus two baby carrots. Ma and I halved the salad (after it had been washed and de-slugged! ), she took the runner beans and the courgettes. I kept the tomatoes Ma didn’t munch! On Sunday, I ate a yoghurt and half a pain au raisin for breakfast then a cheese and cucumber sandwich eaten after I finished with the half marathon volunteering and before the allotment society meeting. For dinner, I had macaroni cheese. Americans would call this stovetop mac and cheese. I call it the only way I know how to make it (make a cheese sauce, add cooked pasta) if I had been less tired, I would have put it in a dish, added cheese and breadcrumbs and put it in the oven but that was too much effort so I just ate it like that. It was amazing and was lunch (with a green salad) on Monday. On Monday I felt really good about my food prep. Rhubarb compote and yoghurt, a pear, vegetables and a dip, leftovers and salad. That was great but by the time I got home on Monday night, I was done. So dinner was dip, tortillas and more vegetables because cooking was not something I was capable of doing on Monday night. Tuesday I packed rhubarb compote and yoghurt, a pear, vegetables and a dip so basically breakfast and snacks but had a lunch meeting. So it was work sandwiches all the way. For dinner I had roasted courgette, onion and tomatoes with potatoes and mackerel. This was also lunch on Wednesday! Wednesday night I sauted leftover potatoes with courgette and mushrooms. Those leftovers were lunch on Thursday! Tom came to dinner on Thursday, so I made meatballs which we ate with pasta, garlic bread and salad. I didn’t take a photo of it but I’ve made it before with rice so just replace the rice in this picture with pasta and Ma with Tom! On Friday, I ate leftover meatballs and pasta and a rock bun! No dinner because there was just too much coughing going on! 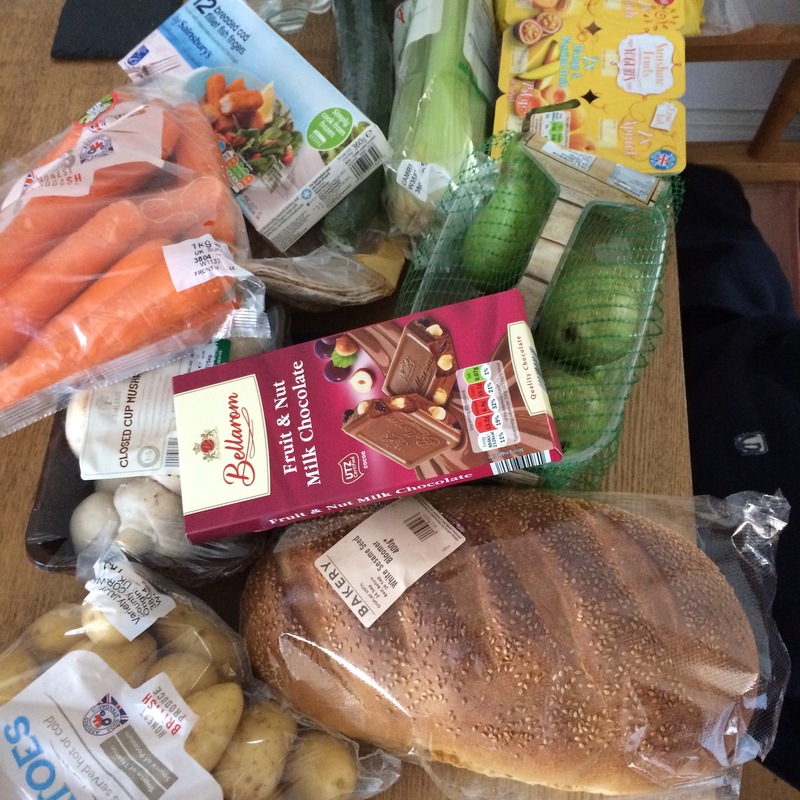 This entry was posted in Cooking, Food, Money and tagged 24 to 30 September 2016, 24/09 to 30/09/2016, budget challenge, food budget, weekly shopping, weekly update. Bookmark the permalink.